Last Call for #TNTTimeOut Contest Entries! CONTEST! 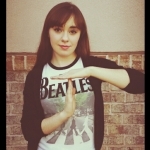 Take a Time Out With Kristina to End Bullying! Meet Kristina Lachaga at Macy's TOMORROW! Kristina Lachaga Concert Announcement - Hersheypark! Kristina Lachaga Opens for Heffron Drive - Plus Meet & Greet Photos! Check Out Kristina Lachaga's Girls World Expo NYC Recap - Plus Meet & Greet Photos! Kristina Lachaga's Song "Calendar" Takes the #1 Spot All Thanks to YOU!